Hortus Camdenensis | Gaillardia pulchella Foug. Fully hardy, upright, bushy annual with yellow, red, or red and yellow flowers in summer. To 45cm. [RHSE, Hortus]. 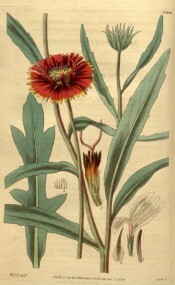 Curtis's Botanical Magazine figures Gaillardia bicolor, with yellow ray florets, tinged red at the base, and red disc. ‘A handsome herbaceous plant with fragrant flowers, which appear to vary considerably both in size and colour, as also in the number of florets in the radius.’ [BM t.1602/1813]. G. bicolor var. drummondii, no doubt the form grown by Macarthur, is figured in a later number. ‘The very pretty Gaillardia here figured was raised in the Glasgow Botanic Garden, from seeds gathered by Mr. Drummond at Rio Brazos, in Texas, in the autumn of 1833. It retains all the character of the wild specimens sent by the same indefatigable collector, except that the plants are larger and the foliage coarser. But this foliage is very variable, entire or more or less toothed or incised, the lowermost and radical leaves pinnatifid, with a greater or less number of segments, and indeed quite similar to that of G. bicolor and G. aristata of authors. The flowers indeed appear different from both of those; but this difference is more dependent on colour, than any thing, and an.attentive examination of numerous specimens of all three, both cultivated and wild, have led me to the conclusion that they are in reality varieties of one and the same species.’ [BM t.3368/1834]. The excellent figure in the Floral Cabinet shows red flowers with a yellow edge. [Fl.Ca. p.57/1838]. Introduced to Britain in 1787. [PD]. Listed in the 1850 and 1857 catalogues [H.105/1850].